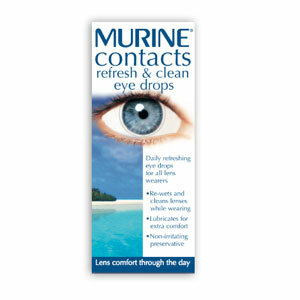 Murine Refresh & Clean Contact Lens Eye Drops keep your lenses lubricated, moistened and naturally feeling more comfortable. The unique formula eliminates fat and protein excess from your tears and atmospheric particles that collect on your lenses throughout a wearing day. Combined with the non-irritating preservative, the drop reducs the chances of an allergic reaction or discomfort.